Anatoly Serov was born on 20 March 1910 in Vorontsovka in the North Urals region (according to other sources he was born on 2 April 1910). He entered the Red Army in 1929 and joined the Bolshevik Party in 1931. He attended the Orenburg Military Air College, from which he graduated on 17 December 1931. Initially he served in the Leningrad area, but was then posted to the Far East. He worked as a test pilot until spring 1937. Serov took part in the Spanish Civil War and he arrived probably in the country in May-June 1937 (the date varies in different sources). During this conflict he flew under the name 'Rodrigo Mateu'. During the spring of 1937, the second group of Soviet volunteers was sent to Spain. 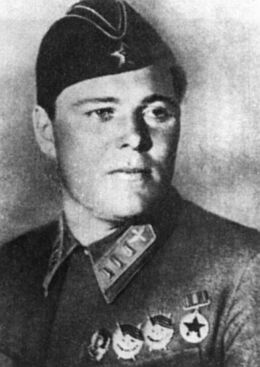 The group was led by Kapitan Ivan Yeremenko and included Leitenant Mikhail Yakushin ('Carlos Castejón'), Leonid Rybkin, Mikhail Petrov, Sergei Shalyganov and Ivan Karpov. They travelled through France with Dutch passports - they didn't speak either foreign language fluently! Not without adventures the Soviet fliers arrived at their destination on 31 May 1937. Arriving with them where Spanish Republican pilots who had been undergoing fighter training at the Soviet flight school near Kirovabad. At the same time as this second group of Soviet volunteers arrived, another batch of 31 Chatos arrived from the Soviet Union, taking the total number supplied to the Republicans to 116. These new fighters greatly enhanced the strength of the I-15 Grupo. After arrival, an escuadrilla of I-16 fighters, designated 1a Escuadrilla of Grupo de Caza No 21 (1a/21), was organized under the command of Kapitan Ivan Yeremenko while Andrés García La Calle was to undergo further training in the Soviet Union. Initially this unit performed defensive duties from Cartagena and Elche to Alicante, protecting Republican warships and cargo vessels from insurgent air raids. Following the redeployment of the I-16s to the north, and the poor quality of the latest batch of I-16s to reach Spain and during a period of forced inaction in June 1937, half of the group was sent to Los Alcazares airfield, where it was re-equipped with the new I-15s. The new escuadrilla was later designated 1a/26 and commanded by Kapitan Ivan Yeremenko. The Russian pilots in this escuadrilla included Evgeni Antonov, Ivan Karpov, Georgii Masterov, Mikhail Petrov, Leonid Rybkin, Serov, Nikolai Sobolev, Sergei Shalyganov and Mikhail Yakushin. The 1a/26 was completed by pilots of different origin; three Spanish, two Austrian, two Americans (one of them was Harold Dahl) and the Yugoslav Bozidar Petrovich. It is also known that Leitenant Leonid Rybkin served as a Patrulla leader and Harold Dahl was part of this Patrulla. Another Patrulla leader was Evgeni Antonov. The escuadrilla, was based at El Soto, had already become operational two days after the Brunete campaign began and where aviation played considerable role. The insurgents increased their presence in the air battles by using German and Italian units armed with the newest aircraft. Nevertheless, Soviet fliers gained considerable success there, claiming numerous enemy aircraft shot down. As a Starshii Leitenant and commander of a Zveno in the 1. Escuadrilla under the command of Kapitan Ivan Yeremenko, Serov was transferred to Campo Soto on 30 June 1937 to take part in the battle of Brunete. The 1. Escuadrilla was at this time equipped with Polikarpov I-15s and operating from Los Alcazares airfield. On 6 July, during the battle of Brunete, Starshiy Leytenant Serov and Leytenant Mikhail Yakushin ('Carlos Castejón') of the 1a Escuadrilla claimed a shared Fiat CR.32. Sargento José Redondo Martín, the Spanish pilot of one of the I-15s, was wounded and Leitenant Leonid Rybkin shielded him, but both were forced to fight nine Fiats. One Fiat collided with another and was set on fire; it was in fact credited to Rybkin. Rybkin and Redondo joined with M. Petrov and I. Karpov whom had flown to help. At that moment Leitenant Mikhail Yakushin, Kapitan Yeremenko, and Starshii Leitenant Serov of the 1a Escuadrilla attacked the leading group of Fiats from above. One Fiat was shot down and the pilot bailed out (claimed as a shared between Yakushin, Yeremenko, and Serov). Pilots of I-15s and I-16s had seen four Bf 109s in the area, but they did not attack the Republican fighter. The Aviazione Legionaria reported that during the morning between Madrid and Brunete, 14 CR.32s of 19a and 20a Squadriglie, led by Maggiore Andrea Zotti (CO XXIII Gruppo), encountered nine I-15s and eight I-16s that were escorting nine R-Zs. The Republican aircraft were joined by other flights from a formation of 20 I-16s as they flew over Madrid. Italian pilots were credited with shooting down seven ‘Curtiss fighters’ during the clash, one of which was claimed by Maggiore Zotti. Three ’Ratas’ were also destroyed, one of which was credited to Capitano Enrico Degli Incerti (CO 19a Squadriglia), while Sergente Maggiore Alfonso Mattei downed an R-Z but was then forced to take to his parachute after his CR.32 was hit by return fire from the R-Z. He landed in Nationalist territory near Pozuelo de Alarcón. The Republican squadrons were effective in defending the airspace above Madrid by day, but the enemy exploited the night to bomb the city. Faced with this situation Starshiy Leytenant Serov and Leytenant Mikhail Yakushin of the 1a Escuadrilla, both experienced night pilots in their own country, having obtained authorization from the high command, set about organizing a night fighter group comprising of Viktor Kuznetsov (CO), Serov, Leonid Rybkin, Yakushin and Vladimir Sorokin. The unit was known as the Patrulla de Noche. It was no easy task, given that the airfields did not have the necessary infrastructure for night operations (beacons, searchlights, etc). They set up some car headlights and lit bonfires along the runway, which the ground personnel covered over at the first sign of enemy presence, and training began at Alcalá de Henares, whose airfield was the most suitable. On the night of 14 July one Ju 52/3m bombed the airfield. Serov’s fighter was damaged while landing and he was slightly wounded in the head. On 24 July, Starshiy Leytenant Serov of the 1a Escuadrilla claimed a Do 17 over Brunete while flying an I-15. It seems that this was Do 17E 27-5 from VB/88, which was lost during the day with the crew of pilot George Kool, navigator Hans Schmidt and radio-operator Keller Schmidt captured. The night interception experiment was put into practice on 25 July. Yakushin took off first to patrol at 3000 meters altitude, followed by Serov, at 2600 meters. Yakushin sighted an enemy three-engined aircraft heading for Madrid. Closing in from astern he opened fire with his four machine guns almost at point blank range - about 40 meters - and exhausted his ammunition. The rounds hit home but the aircraft did not go down, and it altered course and sped off toward its own lines. Back on the ground a disappointed Yakushin discussed the unsatisfactory result with Serov. They decided that if they were to set the Junkers alight they would have to concentrate their fire on the fuel tank, which was located at the union of the right wing with the fuselage. During the night of 25-26 July, informed that enemy aircraft were bombing the Republican lines in the area around the Escorial, Starshii Leitenant Serov and Leitenant Mikhail Yakushin of the 1a Escuadrilla headed for the front, flying over it by night for the first time. Aided by the glow from the fires, they found the patrol zone. "At midnight we received a telephone report of an enemy bombing raid on Republican troops near El Escorial. It was the first time that we had approached the front after dark. The search area was outlined by the fire started by the bombing. Serov remained at our initial altitude of 6500 ft, while I climbed 3250 ft higher. My luck was in, for ten minutes later I spotted an enemy bomber heading towards me. He would not get away. Having let him pass, I turned and began to approach him at the same height from his right and behind. We had learned by then that the Junker's fuel tank was positioned near the right wing root. Having approached the target and slowed down, I fired at that area. Flame appeared along the right side of the bomber’s fuselage. Almost at once the enemy gunner responded, but he was too late. His bomber was already going down in flames. I followed him down almost to the ground. After that we left our patrol area a few minutes early and rushed home to spread the news of our victory. Once out of my cockpit and back on the ground I was immediately grabbed by Serov. He looked as triumphant as I was because our vertical split formation was his idea!" The enemy aircraft was Ju 52/3m “22+76” from 3.K/88. The enemy aircraft crashed near Valdemorillo and Colmenar. The crew of the German aircraft consisted of Leutnant Leo Falk, Feldwebel George Übelhack, Unteroffizier Fritz Berndt and Unteroffizier Walter Brötzmann, which all were killed. The navigator Unteroffizier Heinz Bottcher survived and was captured. The Germans erected a commemorative tablet there, in memory of their dead comrades. This was the first Republican night victory during the Spanish Civil War. Lately a historian and archaeologist found the commemorative tablet. It was much damaged, so he is restoring it at his home. Once finished, the tablet will be presented to the Spanish Air Museum; a copy of it will be erected at its original location. During the night of 26-27 July Serov shot down a Ju 52/3m from 1.K/88 of Pirner with one killed (Unteroffizier August Heyer) and four captured (Johannes Remling, Rolf Pirner, Walter Schellhorn and Bruno Thielebein). The enemy aircraft was claimed near Manzanares. For the success in the night patrol flights flown the last two nights, the Spanish Prime Minister Juan Negrin personally congratulated Leytenant Mikhail Yakushin and Starshiy Leytenant Serov and presented them each with a gold watch and a personal car as tokens of his gratitude. Totally he claimed seven victories during July 1937. After his night victory, Serov was awarded the Order of the Red Banner on 31 July. He was also promoted to Kapitan and commander of the 1a Escuadrilla the following month and to take part in the Brunete offensive. He was to remain here until replaced by Kapitan Evgeni Antonov and transferred to the Plana Mayor of Grupo de Caza No 26 (I-15). On 22 August, Kapitan Serov of the 1a Escuadrilla claimed three shared Ro.37s over Huerva while flying an I-15. In October his unit was based at Sagunto and Sabadal airfields, operating over Barcelona and Valencia. On 12 October 1937, Il’ya Finn (1a/26) claimed a shared Ju 52/3m or Ju 86 over Huesca together with Kapitan Serov (1a/26) and Starshii Leitenant Yevgenii Stepanov. Nationalist records do not confirm this loss. On 15 October 1937, capitán Juan José Armario Álvarez, CO of Grupo No 26 led a strafing attack on Garrapinillos airfield, in Saragossa. To ensure the success of this raid, the armourers worked through the night loading the aircrafts’ machine guns with incendiary ammunition. The 1a Escuadrilla took off from Bujaraloz with twelve I-15s under the command of Kapitan Evgeni Antonov (Starshii Leitenant Yevgenii Stepanov took part in this attack and Kapitan Serov flew in the ‘Plana Mayor’). On 21 October, he was appointed commanding officer of a Grupo de Caza (Fighter Group). He was awarded a second Order of the Red Banner on 22 October 1937. On 21 January 1938, he left Spain. Serov’s total flying time in Spain included 230+ combat hours, and he claimed eight individual and seven shared victories during the course of 48 engagements. On 2 March 1938, he was decorated with the Gold Star of Hero of the Soviet Union. He was also at the same time decorated with an Order of Lenin and promoted to Polkovnik. Back in the Soviet Union, an acrobatic unit with five I-16s was formed under his command, together with his friend Yakushin. Later in 1938 he was promoted to Chief of the Air Inspectorate of the Soviet Union. He remained an active pilot as part of his new job, participating in the I-153 flight-testing program and performing the leader's role in the I-16 'Red Five' aerobatic team. In 1939 he was examined from the General Staff Academy and promoted to the rank of General Leitenant. He was killed on 11 May 1939, during a long-range training flight in UTI-4 trainer, together with the female pilot Mayor Paolina D. Osipenkova, who also was killed (Osipenkova was a women record holder and the wife of another I-15 commander in Spain, Aleksandr Osipenko). They were both buried in Moscow’s Red Square, just outside the walls of Kremlin. To remember A. K. Serov, his name was given to a little industrial town in the Sverdlovsk region, a Flying School at Bataisk, a Technical School and other Soviet State institutes. Serov claimed 8 biplane victories in Spain and took part in 48 aerial combats. He also claimed 7 or 8 shared victories in this conflict (depending on source). Biplane victories: 8 and 7 shared destroyed, some aircraft destroyed on the ground. TOTAL: 8 and 7 shared destroyed, some aircraft destroyed on the ground. (a) Republican fighters claim at least 2 CR.32 during the day in the Brunete area. Only 1 CR.32 was lost during the day, when Sottotenente Vercellio from the 19a Squadriglia was KIA on the afternoon. (b) In this confusing battle it seems that the Republican pilots at least claimed 6 CR.32s while losing 3 I-15s and getting several damaged. The Aviazione Legionaria claimed 7 I-15s, 3 I-16s and 1 R-Z for the loss of 2 CR.32s. (c) Do 17E 27-5 from VB/88 shot down and the crew POW. (d) Ju 52 from 1.K/88. Unteroffizier August Heyer killed and Johannes Remling, Rolf Pirner, Walter Schellhorn and Bruno Thielebein captured. (e) May alternatively have been a Junkers Ju 86. Not confirmed with Nationalist records. Much additional information kindly provided by Alfredo Logoluso. Additional information kindly provided by Vladislav Arhipov. Image kindly provided by Alexei Luks.